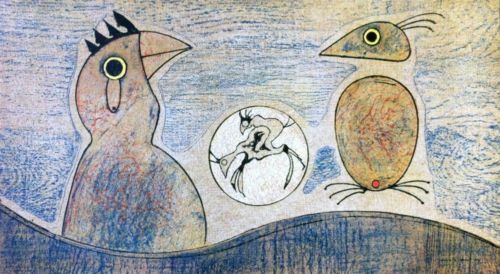 This is a very rare Hand Signed Lithograph, "Oiseaux". by Max Ernst. Max Ernst was born on April 2, 1891, in Bruhl, Germany. He enrolled in the University at Bonn in 1909 to study philosophy, but soon abandoned this pursuit to concentrate on art. At this time he was interested in psychology and the art of the mentally ill. In 1911 Ernst became a friend of August Macke and joined the Rheinische Expressionisten group in Bonn. Ernst showed for the first time in 1912 at the Galerie Feldman in Cologne. At the Sonderbund exhibition of that year in Cologne he saw the work of Paul Cézanne, Edvard Munch, Pablo Picasso, and Vincent van Gogh. In 1913 he met Guillaume Apollinaire and Robert Delaunay and traveled to Paris. Ernst participated that same year in the Erste deutsche Herbstsalon. In 1914 he met Jean Arp, who was to become a lifelong friend. Despite military service throughout World War I, Ernst was able to continue painting and to exhibit in Berlin at Der Sturm in 1916. He returned to Cologne in 1918. The next year he produced his first collages and founded the short-lived Cologne Dada [more] movement with Johannes Theodor Baargeld; they were joined by Arp and others. In 1921 Ernst exhibited for the first time in Paris, at the Galerie au Sans Pareil. He was involved in Surrealist activities in the early 1920s with Paul Eluard and André Breton. In 1925 Ernst executed his first frottages; a series of frottages was published in his book Histoire naturelle in 1926. He collaborated with Joan Miró on designs for Sergei Diaghilev that same year. The first of his collage-novels, La Femme 100 têtes, was published in 1929. The following year the artist collaborated with Salvador Dalí and Luis Buñuel on the film L'Age d'or. His first American show was held at the Julien Levy Gallery, New York, in 1932. In 1936 Ernst was represented in Fantastic Art, Dada, Surrealism at the Museum of Modern Art in New York. In 1939 he was interned in France as an enemy alien. Two years later Ernst fled to the United States with Peggy Guggenheim, whom he married early in 1942. After their divorce he married Dorothea Tanning and in 1953 resettled in France. Ernst received the Grand Prize for painting at the Venice Biennale in 1954, and in 1975 the Solomon R. Guggenheim Museum gave him a major retrospective, which traveled in modified form to the Musée National d'Art Moderne, Paris, in 1975. He died on April 1, 1976, in Paris. Ernst's son Jimmy and his grandson Eric are both artists and writers. Jimmy Ernst died in 1984 and was a well known German/American abstract expressionist painter, who lived on the south shore of Long Island. His memoirs, A Not-So-Still Life, were published shortly before his death.